Nestled in a the scenic foothills of Christmas Hills, Greenstone Vineyards is just a short one hour drive from Melbourne. 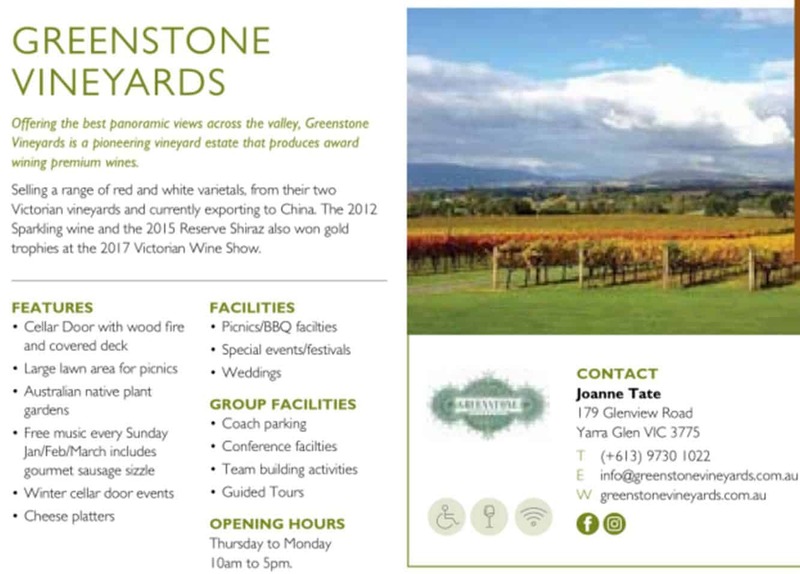 Offering some of the best views of the Great Dividing Ranges, Greenstone Vineyards is a pioneering vineyard estate that produces some of the finest premium quality wines in the Yarra Valley. Selling a range of red and white varietals, visitors are welcome to speak with the knowledgeable staff and learn more about the advanced production methods employed at Greenstone Vineyards. Originally Heathcote based, Greenstone Vineyards acquired the former Sticks Yarra Valley Winery in early 2015, an expansion which added a further 33 hectares to its portfolio. Specialising in Pinot Noir and Chardonnay from their Yarra Valley vines, as well as rich Sangiovese and Shiraz from their Heathcote vines, Greenstone has truly shown its versatility in producing inspiring, hand-crafted wines. Visitors can relax while tasting the wines, indulge in a gourmet cheese platter whilst soaking up the view from the beautiful deck area, or unwind by the open fire in the cooler months. The winery also offers ‘Sunday Sessions’ every Sunday from November through to March, featuring bands on the lawn stage and a gourmet sausage sizzle to tempt. Bookings are essential for groups of 8 or more.